Karli is a Seal Point Preferred Pattern Queen. She was bred by Florence Dickinson of Alfacentory Cattery in Ottery St Mary, Devon, UK. Karli joined our family in August 2011 when we imported her from the UK. 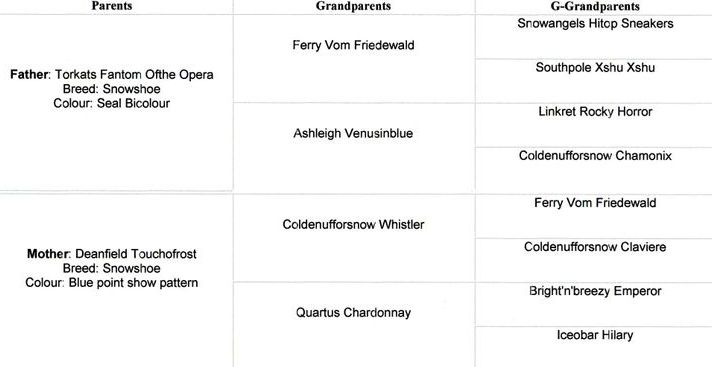 Her sire is Torkats Fantom OfThe Opera & her mother is Deanfield Touchofrost. Karli has a delightful purrsonality - she is a dedicated companion and very interested in everything her humans do around the house. She can be very playful, but also very laid back at times. With Karli there are two speeds - flat out playing, or flat out sleeping! A fifth Generation Snowshoe, Karli's maternal half sister Alfacentory Crystalline was the TICA Western European Snowshoe of the Year in 2011. 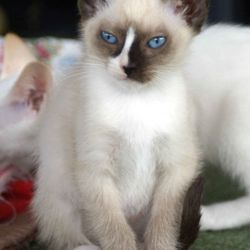 Her bloodlines represent the best British Snowshoe lines available.